UPDATE 4/30/13: I made this dish for Chef Andrew Zimmern on an episode of his TV show on Travel Channel “Bizarre Foods,” and Zimmern liked it so much he made his own version of it at the Austin Food & Wine Festival. Here is Andrew’s version. Most of the doves we bring home get plucked and served whole, usually grilled. I realize not everyone wants to do this, and I hear a lot from hunters who simply breast out their birds and eat the meat in skinless halves. If you’re one of those people, this recipe is for you. Fear not, nose-to-tail folks. While I did indeed breast out 12 doves to make this dish, it was only after I plucked them; you’ll have to wait a few days to see what I did with the rest of the doves. 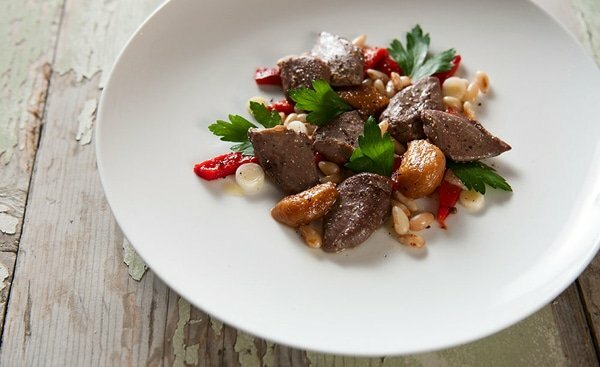 Dove breasts make such a pretty shape on the plate, and each piece makes a perfect two bites. (One bite if you are ravenous.) So my first thought when I was thinking about a recipe was to make a main course salad. Thinking a bit more, I realized that in addition to it being dove season, it also happens to be the season for preserving roasted red peppers, and for gathering pine nuts. Hmmm… the Spanish do a fair amount of dove and pigeon hunting, and they are the kings of roasted red peppers, and they’re big on pine nuts, too. Guess I’ll take this dish in a Spanish direction. After that decision, the rest came easy. A good main course salad hinges on a combination of fresh and preserved ingredients, acid, fat, something savory, a little sweet and maybe a bit of spicy heat. This salad hits all the bases, plus its a snap to put together. The only “hard” part about this recipe is the garlic: I used my own preserved garlic for this dish, and I urge you to make some if you can. But you can also simply roast a head of garlic and use that, too. Roasting garlic is super easy: My friend Elise’s recipe is foolproof. Only if you do this, don’t roast for the full 35 minutes. Cook the head of garlic for only 25 minutes, so the cloves will still kinda-sorta hold their shape when you remove them. You cook the doves using my equally foolproof poaching method: Get hot stock to a simmer, turn off the heat, drop the dove breasts in and walk away. I left these dove breasts in for 15 minutes, and while they did get a little gray on the outside, the inside was perfectly pink and tender. Next time I’ll only leave the breasts in for 8 to 10 minutes. You can also sous vide the dove at 135°F for 30 minutes, but for that you will need a sous vide machine and a vacuum sealer. Everything else to this salad is just arranging things on the plate. 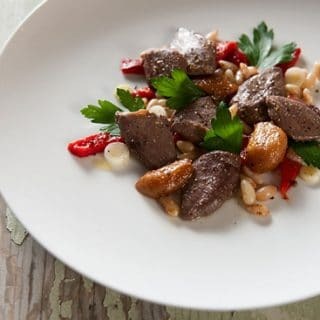 The pine nuts — I used native pine nuts from Nevada — add crunch and richness, the preserved peppers color, sweetness and a tang from the vinegar, green onions bring texture, parsley a hint of bitter, and the garlic adds soft, mellow sweetness. You eat this by cutting the dove breast in half and piling on some of the other flavors. Each bite will be different, depending on what you combine it with. I gotta say, this dish is a triumph. It is easy to eat, colorful, with varied textures and flavors. I can imagine eating this the evening after a hunt in Spain, with a glass of Rioja rosé or Fino sherry and lots of crusty bread. Classy, full of flavor, and — dare I say it — easy to make. This is something of a pantry dish that comes together very rapidly if you have the ingredients on hand. The hardest part of putting this together is the garlic: I use my own preserved garlic, and if you have some use it -- it makes the dish. If you don't have any, roast a head of garlic instead. It's not the same, but it will get you close. Everything else in this recipe is easily available at supermarkets. 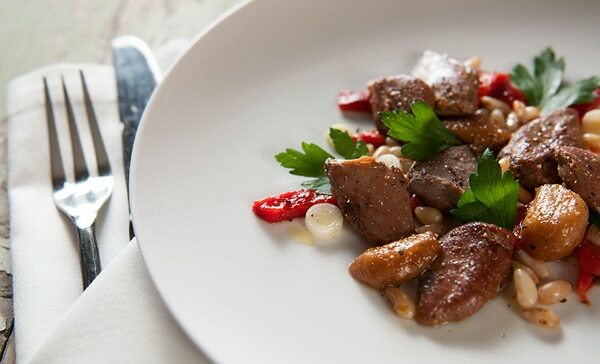 If you don't have squab, pigeon or dove, use quail breasts. Quail will get you closest in terms of size and texture, although the flavor will be different. If you are not using preserved garlic, roast your garlic as per Elise's instructions. When the garlic is done, carefully remove the cloves. This is persnickety, but you can also just smear them out and use the roasted garlic as a sort of puree at the bottom of everyone's plate. It may look messier, but it still tastes good. Toast the pine nuts in a dry sauté pan over medium-high heat, tossing them frequently to toast all sides. Pay attention to them as they toast because pine nuts go from nicely toasted to burnt in seconds. When they have some pretty browned spots on them. move the pine nuts to a bowl to cool. To compose the salad, divvy up all the ingredients between four plates and drizzle a little of the olive oil from the dove bowl over everything. Garnish with some parsley and grind black pepper over the plates. Serve at room temperature with some Spanish sherry, a rosé or white wine or a crisp lager or pilsner beer. Great dish. Got 15 breasted doves from a friend. I did use sous vide, shaved some hard cheese, and put on bed of mixed greens. I found a recipe a lot like this for Pate on-line, about four years ago. It was great. I thought maybe it was your inspiration and you could send me a copy of that one or tell me where to look for it. Please, it was my father-in-laws favorite and they just left for dove hunting. Ann: I have no idea what you are talking about. This is absolutely nothing like a pate.